[0:38] <demlak> i was experimenting with TIP121 and a 12v DC halogen lamp.. works good.. but what about dimming 230V AC lights? do you know a simple tutorial/shematic? [0:39] <pksato> demlak: AC is more complex. need to control triger of a triac. [0:41] <rikkib> Hmm Looks like 400mm of wire for the spi works but a meter of wire does not. [0:41] <demlak> you know of a tutorial for it? [0:47] <pksato> need know how hardware work to write a program to control it. 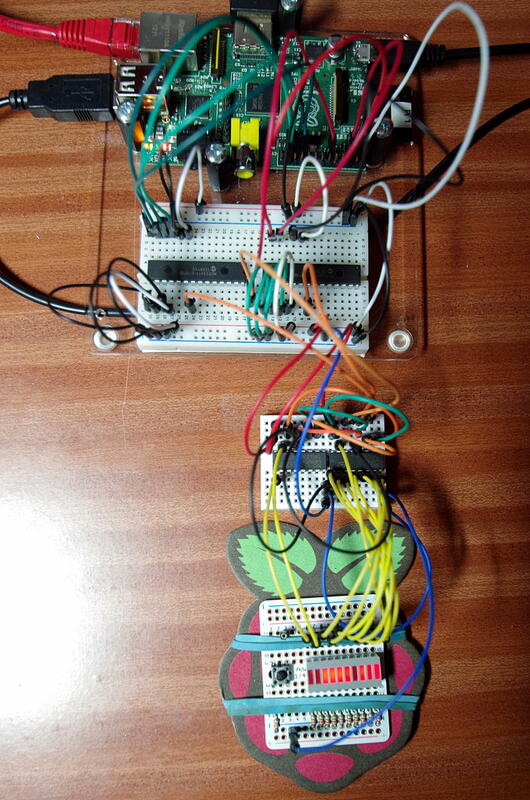 [0:47] <demlak> well.. i know how to controll PWM pin on RPi..
[0:48] <pksato> demlak: for AC aproache are different. [0:49] <pksato> Its like a PWM, but need to know when (time) activate. [0:50] <pksato> or use a power mosfet, but, result can be not as expected. [0:58] <pksato> On the end, this circuit control DC. [1:01] <pksato> replace moc3041 one without zero crossing detector. [1:15] <pksato> but, have a Zero Cross Trigger. [1:18] <pksato> for resistive load, lamp or heater, can try to control number of cicles per time. [1:24] <demlak> hmm.. well.. i think i found a "problem".. pwm dimming AC with zero cross triggering has a max frequency of 50hz.. hmm... means 230v/50 = min. volt.. and every step would be 4,6v.. maybe theese steps are not smal enough..
[1:24] <demlak> am i right? for a more detailt dimming i would need phse cutting or phase firing? [1:26] <pksato> no, aways have a 230VAC. [1:26] <pksato> and a full power, per cycle. [1:32] <pksato> its is wrong. [1:32] <pksato> tip121 is a bipolar darligton. not a n-mosfet. [1:33] <pksato> and, can no get full saturation using rpi 3v3 logic. [1:37] <pksato> it was a normal bipolar transistor, output of RPi would fired. [1:46] <promet> Heya, anyone working on motor control with their pi, perhaps with pyblaster? [1:54] <promet> Hi, anybody home? [3:26] <Jaimbo> Hey guys, I was wondering if someone could tell me how to add the green [ OK ] to my init scripts like the default boot scripts have? [3:27] <shiftplusone> I don't know, but that shouldn't be something you explicitly add. It should be something handled by sysvinit based on the return values, I suppose. What does your script look like? [3:31] <shiftplusone> what was the problem? [3:40] <Jaimbo> Yeah I sorted it! [3:44] <shiftplusone> What sort of load? [3:47] <Jaimbo> Are you familiar with CouchP and SickB? [3:49] <Jaimbo> But that is going to drag the rar files from the second pi, over the network, process them on pi number one and then send them back over, wouldnt it? [3:49] <shiftplusone> Your main bottleneck is probably IO and network, rather than RAM and CPU, right? [3:54] <shiftplusone> Haven't tried that myself, though my router does support it. [3:55] <Jaimbo> How does the Pi react to networked storage? [3:56] <Jaimbo> As it is now, it works. [3:58] <ShorTie> if bandwidth is your problem, doesn't that mean moving things around on your network actually is going to make the problem worst not better ?? [4:00] <shiftplusone> Hmm... the company just doubled the price of my plan and are telling me how great it is that it's $1 cheaper than what new customers get. [4:09] <shiftplusone> Three were terrible and no longer operate here. [4:14] <shiftplusone> Don't you guys also have sprint? [4:14] <Jaimbo> Many thanks for the help guys! [4:17] <shiftplusone> Hmm, might go with my ISP's (iiNet) mobile plan. They're generally a good guy... successfully fighting stupid new laws, American 'trade organizations' and so on. [4:22] <shiftplusone> He contacted the telecommunications ombudsman and the company was forced to refund everything. They ended up including free data usage for next month as well. [4:24] <shiftplusone> Nuh, that sort of thing happens all the time. The telcos are clearly in the wrong and the worst they can do is refund your money and cut off your service. [4:25] <shiftplusone> I think they'll crack down on that sort of thing sooner or later. [4:26] <shiftplusone> Reminds me of the ridiculous days when mobile service providers would charge silly amounts for SMS, MMS, WAP and such. [4:29] <shiftplusone> but I think they should really provide the option of limiting the service until the end of the month (as normal ISPs do) rather than charging by the MB. [4:58] <shiftplusone> I haven't looked at it closely before... thought it was yet another BASIC, but its actually a good idea. [5:07] <Psil0Cybin> hey whats up guys! [11:26] <gordonDrogon> shiftplusone, DexBasic was really a big set of macros for an assembler last time I looked. Good indea though. [11:27] <gordonDrogon> He has popped in here from tiem to time. [11:28] <shiftplusone> Ah, under what nick? [11:28] <gordonDrogon> not 100% sure, but I recall chatting with him briefly. [11:31] <gordonDrogon> don't they give you a link? [11:31] <shiftplusone> djazz, was wondering where you get music for your radio thing from a while back. [11:32] <shiftplusone> I forgot jamendo don't allow streaming without buying a license. [11:33] <djazz> why you wonder? [11:34] <shiftplusone> djazz, made a little jplayer thing with a file browser and considered throwing a demo out online with free music. [11:36] <shiftplusone> djazz, another question... I am guessing you used icecast? [11:37] <shiftplusone> with mpd perhaps? [11:40] <shiftplusone> do you know what controller it uses and what interface it provides? [12:06] <shiftplusone> If there are no libraries for it for the pi and if there's no linux driver, porting the arduino library isn't hard. [12:08] <shiftplusone> How's your C and have you worked with any LCD before? [12:10] <edjuh> My C is non-exsistent, and no LCD experience (NOOB de luxe) but ..
[12:11] <shiftplusone> In that case, if you can't find someone who has done all the work already, you'll have a little bit of learning. [12:12] <gordonDrogon> I'd not recommend it myself. There are other LCD touchscreens for the Pi that will just work. [12:12] <gordonDrogon> that's Arduino too - probably only run at 5v. [12:12] <gordonDrogon> might run on-top of a Gertduino, but then you have the issues of sending data to it via the Gertduino. [12:14] <ShorTie> is it the touch part that is so fasinating, it surely can not be the size is it ?? [12:16] <shiftplusone> gordonDrogon, I've looked at the arduino source code, it's all fairly straight forward. Wouldn't be hard to add it to wiringpi at all. [12:18] <gordonDrogon> I have too many displays... Have you looked at the 4D systems ones? [12:19] <gordonDrogon> I could probably make a library for it based on my 128x64 library though. [12:19] <gordonDrogon> that uses an 8-bit parallel interface to draw on the screen. [12:20] <gordonDrogon> shiftplusone, yes - to program them, not to use them. [12:20] <gordonDrogon> I had to run up XP on my old laptop. [12:23] <gordonDrogon> ShorTie, sure - but I thought you wee surprised at the smalness of a touchscreen..
[12:24] <gordonDrogon> the tricky part is adding small screens like that into the kernel - but 95% of that has already been done and published. e.g. the Adafruit one. [12:24] <gordonDrogon> however using them standalone is still pretty easy. [12:24] <gordonDrogon> e.g. driving from a drdicated program rather than using them as a console framebuffer. [12:25] <gordonDrogon> I get over 130 fps on that little 128x64 display. [12:25] <gordonDrogon> but you only need to update it when something changes - so for the clock demo, it gets updated once a second. virtually no cpu overhead. [12:30] <gordonDrogon> or use external buttons rather than touchscreen ones. [12:40] <markedathome> anyone got the fft gpu stuff working? or kbow which forum it is being discussed? [12:41] <markedathome> in particular is it computing on the gpu and returning resultss to the cpu and plotting, or is the gpu plotting the results? [12:42] <shiftplusone> . It arrived cracked (hurray for ebay). Eventually got a breakout board that worked. The point being that once you get one working, other similar LCDs aren't hard. [12:42] <markedathome> I am trying to work my way through the code. [12:42] <shiftplusone> Usually you just change the function to write the command and data, change the commands that are sent and the init sequence. [12:44] <shiftplusone> That's the one. [12:45] <markedathome> I bought a plain board, didn't see that one until a couple of days later... still it is a nice dev board. [12:45] <shiftplusone> They come with the LCD now though? [12:46] <shiftplusone> I got the one without the LCD, and getting it separately was pricey. But that doesn't look bad. [12:46] <shiftplusone> I learned a lot with that board (and am still utterly clueless). [12:46] <markedathome> I got that one which is what I assume you got? [12:49] <shiftplusone> wouldn't the non-realtimeness of the pi be an issue there? [12:50] <markedathome> dunno. know it can't read above 25Mhz or something, maybe a bt less. [12:51] <shiftplusone> Gordon gave me some numbers a while back, but I forget now. [12:53] <shiftplusone> markedathome, anyway, the best forum to ask about the FFT library, is probably THE forum, since that's where the devs are. [12:54] <shiftplusone> Just ask on the forum. [13:59] <gordonDrogon> GPIO limit is that its driven via a 19.2MHz clock, so bitbanging a clock is limited to 19.2/2MHz absolute max. [14:00] <gordonDrogon> some gpio functions can go faster - e.g. the SPI bus. [14:01] <gordonDrogon> I have toyed with the idea of hooking up my old Apple II drives to the Pi. Speed-wise it's more than fast enough (the Pi - Apple II runs at 1MHz) but there will be issues like interrupts & latency, however as long as you check the checsums, then reading it ought to be possible. Not sure I'd try writing it though. [14:08] <Doxin> so how unstable is the 5v line on the rpi? I'm having problems getting some i2c devices to work, and I noticed the LCD flickering when the rpi is on. [14:08] <gordonDrogon> ^what he said. [14:11] <gordonDrogon> well.. if you're just using I2C then you might get away with it, but some fast i2C devices actively pull the I2C bus up to 5v - which will potentially kill the Pi..
[14:11] <gordonDrogon> Remember - the Pi's GPIO is all at 3.3v. [14:12] <gordonDrogon> stick a big capacitor of the 5v you take from the Pi to your devices - 16v, 47�F e.g. [14:12] <ShorTie> LCD flickering, sure your not just over drawing what the rPi can supply ?? [14:12] <shiftplusone> I was under the impression that using an open collector was a defining feature I2C, so I2C devices are unable to to pull anything high by themselves. Have I been living a lie? [14:13] <gordonDrogon> shiftplusone, that's true for most - but some high speed ones can drive it high. [14:16] <gordonDrogon> Doxin, what's the device you have connected? [14:19] <gordonDrogon> ok. the only I2C ones I've seen so-far have been the adafruit one. [14:21] <gordonDrogon> and i2cdetect shows nothing? 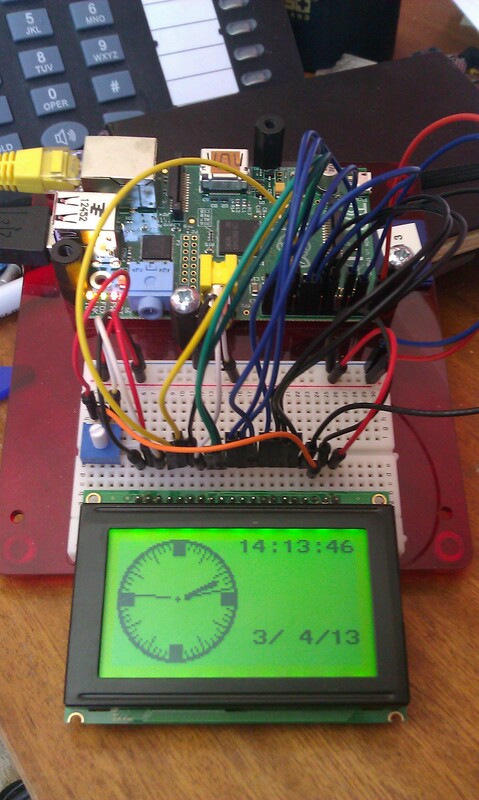 [14:23] <gordonDrogon> oh well - at least your I2C is working OK on the Pi then. [14:25] <gordonDrogon> if it were me, and my Pi... I'd probably try it directly without the level shifters.... However I'd never recommend anyone else do this. [14:29] <gordonDrogon> is your other device also working via the level shifter? [14:56] <Doxin> gordonDrogon: also is that 200ma limit even relevant on the 5V line? [15:00] <gordonDrogon> if you power the Pi via the GPIO then that limitation goes away - at the expense of less protection. [15:10] <gordonDrogon> who knows (if the LCD is broken). [15:10] <gordonDrogon> hard to test, really. [15:10] <gordonDrogon> do you have any other I2C devices you can run on the othe side of the level converter? [15:10] <gordonDrogon> what's the other I2C device on the inside? [15:11] <gordonDrogon> can it run at 5v? [15:11] <gordonDrogon> pretty sure they're fine at 5v. [15:14] <gordonDrogon> becareful ... anything. [15:44] <gordonDrogon> ah well. just a thought. [16:17] <Raynerd> Hi, hoping someone could help. I`m currently at work in a school and trying to connect a RasPi to the internet through a proxy. I have set proxys and it works in internet explorer and can get apt-get BUT I can`t seem to use a script to upload data from the GPIO to a website! [16:18] <Raynerd> When I try and ping any site I get NO repsonse so in my opinion I`m not seing outside of the local network in terminal. [16:18] <Raynerd> then I don`t really understand networks.... any help appreciated. [16:19] <Raynerd> works fine at home so know it works. [16:24] <Raynerd> is there a terminal command to "see" what proxys are set? [16:25] <Raynerd> Is there no command to just check what proxys are set?? [16:36] <Raynerd> No one got any ideas? Proxy set as far as I can see. Is there no way to check? [16:39] <Raynerd> Doxin - how would I go about finding exactly what port I`m using? [16:58] <quem> sigh. i have 32gb cards that my raspberry pi can run raspbian off just fine. [16:59] <quem> but it's not booting. [18:36] <gordonDrogon> I'm under the impression that USB3 things will fall-back to USB2... why not plug it in and see? [18:41] <gordonDrogon> would it not be prudent to just get one of the many ones that people know work directly on the Pi? [18:44] <rwb> Hmm.. I would probobly rather that. Any advice? [18:45] <oldtopman> I have a USB 3.0 external had drive - works great on my old laptop with 2.0 ports. [18:50] <rwb> Thanks for the links! [18:51] <gordonDrogon> yea, must admin I prefer wired to wireless. [18:59] <funkster> need to brainstorm the best way to do this guys: have rip device that connects over wifi. i built a script that will send the available wireless network to a public server/app where you select wireless network and the password, rip then takes that info and connects to wireless network, all while wired. my issue, is i want to only use wired when there is no wireless, and wireless when there is no wired. [19:08] <rwb> I have not use it, but maybe keepalived? 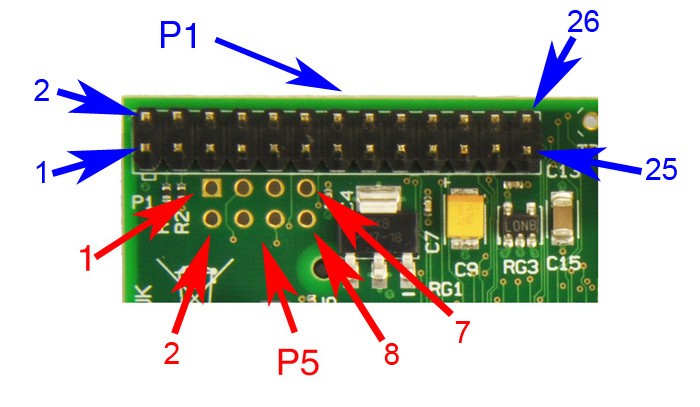 [19:16] <basti> why didnt put the deleopers of the pi ver2 a pin strip on the secondary gpio connector? [19:17] <IT_Sean> secondary gpio connector? [19:17] <IT_Sean> In the middle? [19:18] <IT_Sean> I'm not sure which you are referrign to, sorry. I haven't got a raspi in front of me. [19:19] <funkster> Jusii: correct. is wicd/networkmanager part of the /etc/network/interfaces setup? [19:20] <IT_Sean> Oh, that one. I would say for two reasons 1) lack of interest / support and 2) cost. [19:21] <funkster> ok so.. what is recommended to accomplish my end goal. bast and Jusii seems to be have two conflicting statements? [19:22] <funkster> Jusii: when you say "use" what do you mean, do you mean it will re-route so all traffic goes over eth0/wired but wireless is still "connected" or? [19:28] <funkster> is there a way i can ping though a certain network device? when i have wireless/wired connected it defaults to wireless, id like to disable wireless but make sure wired works, when i use ping -I eth0 yahoo.com, it doesn't go though, and looks like its due to the default route. - anyone have an idea? [19:29] <funkster> xenrar: i did you read what i said? [19:29] <xenrar> funkster: then the device isnt your problem... have you checked your routes? [19:30] <funkster> and looking for a overall solution on what to do… geez man. [19:31] <xenrar> what are you trying to acheive ? [19:32] <xenrar> "when i ping it doesnt go"
[19:32] <funkster> i stated what i needed, if you are confused then ask, but you are just relating exactly what i said. [19:32] <funkster> the ping isn't successful, doesn't reach destination. [19:32] <xenrar> funkster: what does the route comman output? [19:33] <xenrar> are you using dhcp on the wired link >? [19:34] <xenrar> so just add a default route for eth0... "route add default gw 192.168.x.x eth0"
[19:35] <funkster> that will remove the wlan0 default gateway then, correct? [19:36] <funkster> i can have two default gateways on two different interfaces in the route table? [19:37] <funkster> so, when i have only eth0 connected, the default gw is correct, when i ifup wlan0 is remove that default gw - how can i disable that from happening? something in the network manager? [19:45] <xenrar> funkster: are both the wireless and wired connections for internet access? [19:45] <xenrar> funkster: are you using one as a backup? [19:46] <funkster> in a sense, a backup. yes. [19:46] <IT_Sean> what if both are available? what if neither? [19:48] <funkster> IT_Sean: wired will be used if both, if none.. then we we just loop a script until we detect internet connected. [19:49] <IT_Sean> Well... you've just thought of everything then, haven't you!? [19:50] <funkster> i will ifdown wireless when i detect wired is working, and i will ifdown wired if i get a request coming in to go wireless only. [19:51] <funkster> what script exactly? in the ifup? [19:53] <Doxin> I'm having some trouble getting a YWRobot i2c lcd to work. I've got it hooked up to the i2c bus through a level shifter, and my multimeter indicates comunications should be working on both sides of the shifter, and yet the lcd doesn't show up in i2c enumeration. any pointers? [19:53] <funkster> that could work. [20:54] <Raynerd> shiftplusone: You about? [20:55] <Raynerd> Hi. I was looking for some helpas i am gutted! [20:56] <Raynerd> Anyway, took it into school today and still I can't connect via school proxy and network! [20:57] <Raynerd> I added the proxy scripts in terminal that you told me to and still nothing!! [20:57] <shiftplusone> are you sure it's just a proxy and there's no extra login page? [20:58] <Raynerd> How do you mean? [20:58] <Raynerd> Oh, like user and password? [20:59] <Raynerd> shiftplusone: No, definitely. Just proxy and port and you are in. [21:01] <shiftplusone> did you check for error messages? [21:03] <Raynerd> Sorry.. You have lost me but I'd like to know more. [21:03] <Raynerd> shiftplusone: That is beyond me. [21:04] <Raynerd> ShorTie: no, didn't know those commands. You know ifconfig. Is there a code which shows the set proxy settings? [21:08] <Raynerd> shiftplusone: Haha, give me a break man! I'm trying. I've added to this code and I'm buzzing. [21:10] <shiftplusone> ShorTie, the word on the street is that, he can access stuff from the browser just fine, so I am not sure ifconfig will shed any light there. [21:12] <Raynerd> Is that the site that it is uploading to??? [21:13] <shiftplusone> eh? It's uploading to xively, as you know. [21:13] <shiftplusone> Do you get text saying "Xively Error: " and then... some error? [21:14] <ShorTie> what is in resolve.conf and does it get updated properly ?? [21:16] <Raynerd> This is why I am close to tears!!! On my pi I can access https://api.xively.com/v2/feedsin the browser!! [21:16] <Encrypt> Is it me or Mouser is far cheaper than Farnell? [21:16] <Raynerd> Is there any reason why I couldn't access a site from terminal??? [21:17] <magnulu> hi.. I have connected a seven ds18b20's to my pi.. now I get strange readings from one of the sensors.. either 85.00 celsius or 127.94 celsius, nothing else.. any thoughts? [21:17] <shiftplusone> Raynerd, are you are the school now? can you do some testing? [21:19] <Raynerd> shiftplusone: I am not totally devastated. The whole exercise has shown I can setup and pi and connect it to the internet at school!! I just need to get this working for the one pi that will become the weather station! [21:20] <shiftplusone> you can user IRC from the school next time you're there? [21:20] <Raynerd> Yes... We have just switched host and unbelievable web irc is not blocked! [21:21] <shiftplusone> I'll probably be a bit too busy then, but I have a few ideas. [21:22] <Raynerd> Are you UK? [21:22] <Raynerd> That figures... You are always on in the evening and not during the day! Now I see why. [21:24] <shiftplusone> and just try running "import requests" then "r = requests.get('https://github.com/timeline.json')" then "r.content"
[21:28] <Raynerd> ShorTie: airpi? No no no!!! [21:30] <ShorTie> thats a weather station ?? [21:33] <shiftplusone> ... did I mention you should play around with python? [21:33] <shiftplusone> If not, you should play around with python. [21:35] <Raynerd> shiftplusone: Thanks for the advice :-) I've been playing! [21:35] <Raynerd> shiftplusone: Before I go was it the first or second link re hardcoding proxy in? [21:37] <uriah> just wondering... how stable can i expect the rpi-3.13.y kernel git branch to be atm? [21:37] <shiftplusone> uriah, probably a "try it and see" sort of question. [21:38] <uriah> has anyone tried it out? [22:25] <SebSemmi> how I can reach the Pi via ssh by the hostname not the IP address? [22:27] <shiftplusone> Make sure you use your router's DNS and make sure your router provides that functionality. [23:10] <dRbiG> any news about accelerated Xorg on rpi? [23:33] <limitz-ARSNL> gordondrogon: it is possible to interface WiringPi with the MCP23017 correct? [23:33] <gordonDrogon> limitz-ARSNL, hi - sure. there's a driver for it. [23:34] <limitz-ARSNL> is this what you are referring too? [23:36] <gordonDrogon> that might work. won't be too fast and be careful of the current draw - the 2003's are 500mA max.